Compliant with IAAO standards, capable of appraising, assessing and tracking multiple years of vacant and improved real estate. 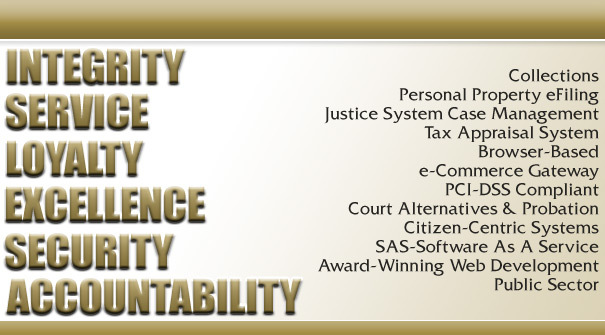 Provides entities with unparalleled supervision and reporting tools to manage individuals prescribed by the court system to be monitored as a productive member of society. Streamlines over-the-counter operations by delivering seamless transaction processing. Multi-year web based property tax rendition system. Internet-based electronic payment system enables credit card and electronic check payment processing via the Internet. Award-winning browser based tax billing, collection, and distribution system utilizing relational database integration. Browser-based solution to provide online bills for convenient and reliable payments. Browser-based solution to provide online reservation system for numerous entities or departments. Go to the Partnerships Page. SAS® software comes easy to Texas public sector organizations. Comptroller Susan Combs urges Texans to claim Federal Tax breaks. 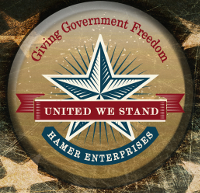 For over 40 years, Hamer Enterprises has specialized in Public Sector Solutions. Products have addressed Property Appraisal, Property Tax Collection, Voting, Justice Systems, and eCommerce. Our solutions are focused on providing a "citizen centric" experience for the government entities and the citizens they serve.